We only know one way to repair accident damage to your car - the right way. At Brennan Bodyworks, we never take shortcuts and invest in only the top collision repair equipment, as required by Audi, Nissan, Porsche, Mrecedes-Benz and our own high standards. Our I-CAR and ASE certifications are your assurance that only skilled, experienced technicians work on your car. It is our policy to undertake repairs only if your car can be returned to factory specifications, and that the damage won't compromise you and your family's safety. Unlike many shops, our first approach is to replace body parts with original equipment. Reconditioned parts are bought only as a last resort. There is no reason for you to accept anything less than superior auto collision repair - and at Brennan's that's all we offer. Brennan is a premier collision center certified by Audi, Porsche, Nissan GT-R and Honda ProFirst for having met their standards for tools and training to repair steel, high-strength steel and ultra-high strength steel as well as customer care, training, repair processes, equipment and tools. 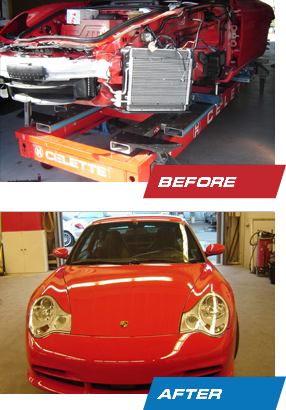 Brennan's is one of the only independent collision repair centers in Central Florida to invest in the Celette frame system - the leader in vehicle straightening equipment. We use only jigs dedicated to your vehicle to produce the most accurate repair. Today many manufacturers like Mercedes-Benz, Audi, BMW, Porsche, Jaguar and VW prefer and in some case require the use of Celette dedicated fixtures to repair their vehicles. The Wielander & Shill welder is considered the best available. It is the preferred choice of Mercedes-Benz, Audi, Porsche, Ford, Honda and many other major manufacturers. Garmat USA is the leading manufacturer of ecologically responsible paint booths. The drive-through design with its downdraft air flow and 1.4 million BTU heater assures a factory-new finish on your car. At Brennan's, we specialize in color matching, ensuring a perfect match of repaired and undamaged areas. We apply Standox automotive paints - the world's leading supplier of environmentally compatible refinishing systems.